Fountain pens are no longer made, and you can’t get ink for them. Probably the most common reaction to showing any interest in using a fountain pen, at least in North America. If an increasingly monopolized roster of stores doesn’t choose to carry something, it must not exist, right? Well, I only have three bottles of vintage ink, and every maker of ink I refer to bar one or two is, as far as I know, currently in production. Similarly, there is a current, and apparently growing roster of modern makers of fountain pens. That Shakespeare line about how well one’s philosophy describes the actual state of the world is applicable in this case. A fountain pen comes to be molded to its owner’s way of writing, and will be destroyed if borrowed by an other. This is a useful item of misinformation, as it allows the owner of a fountain pen to decline lending. 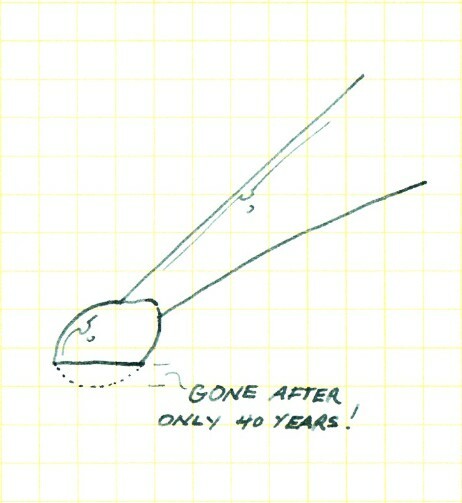 There is a nugget of truth to this, as a pen held in a very specific way every time it is used will eventually come to have the tipping flattened out to reflect this treatment, and may also see the tines somewhat deformed. By “eventually”, I mean over the course of several decades. A casual lending won’t cause serious trouble, although the borrower of a pen that has been thus amended won’t like it very much. There is also the fact that someone who is profoundly ignorant of the correct way to apply a fountain pen to paper, one who mashes it down with vastly excessive pressure, can well destroy it. That’s nothing to do with the way the owner’s hand has previously affected it, though. Fountain pens are a constant danger to clothes, hands, and adjacent surfaces through leaking, and only lunatics use them. True for very old pens with very simple feeds, especially towards the end of their ink supply, but for the most part pens made after 1940 or so are not apt to dribble. Finger stains are usually the result of holding the point itself, rather than the part one should hold; complaining about this is like complaining after holding the fuzzy bit on a felt marker. It is possible to flick droplets of ink from the pen by waving it about madly, but it’s also possible to stick a pen of any sort in someone’s eye by the same action, and one might look at the flying ink as a warning that there’s dangerous flailing going on. Leaking in the strict sense, mere dripping without provocation, is a sign that there’s something gone wrong with the pen. This can be said of ball-points and rollerballs, too, which have been known to expose their contents to the world. Fountain pens explode in airplanes. There is a nugget of truth to this. If a pen with liquid ink is taken rapidly into a lower atmospheric pressure, and there is a bubble of higher-pressure air trapped on the far side of the ink from the usual outlet, ink will get pushed out of the pen. In 2009, I saw a rollerball with a little logo on it declaring it was less likely to erupt in flight; it’s not a problem exclusive to fountain pens. The cure for most pens is to keep them point-upward during ascent. 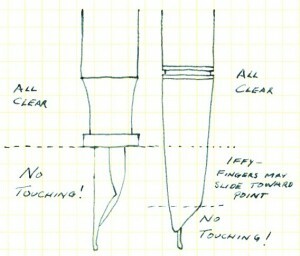 Once the plane is cruising, the pressure inside the pen should be equal to that outside, and the pen can be used with freedom. Some also suggest keeping the pen upright during descent. Through the magic of mirror-imaging, here’s me writing left-handed, and in no danger of smudging. Left-handers may not use a fountain pen. The reason given for this is that they will drag their hand through the not-yet-dried ink and smudge the page. This objection also applies to ball-point pens, whose occasional deposits of over-abundant goop can make a sad mess of page and hand. This is why left-handed people are constantly contorting themselves relative to the page. In all honesty, a left-hander who has adopted underwriting is well along the way to holding a fountain pen the right way. 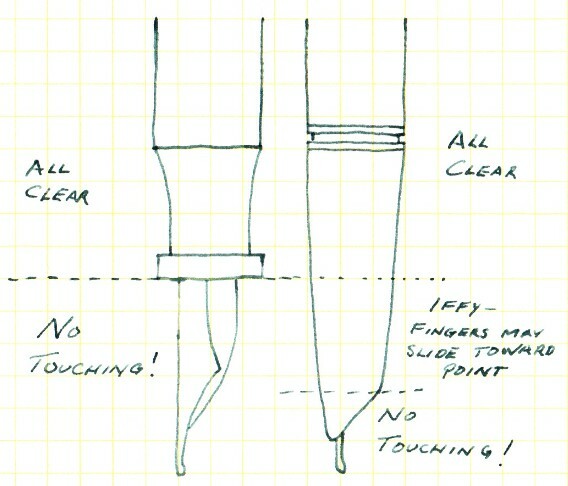 A quick examination of the page to do with writing will show that a well-held fountain pen has its business end well above the point where the writing hand contacts the page, regardless of handedness. A fountain pen will make my handwriting better. 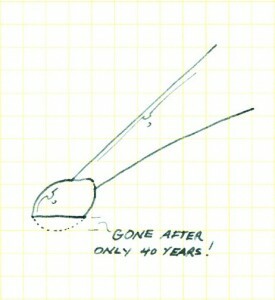 Alas, there is no (powerful) magic in fountain pens to allow this sort of transformation. Many people notice an improvement in their writing because they don’t have to wrestle with the pen to get a line out of it, but beyond this relaxation effect a fountain pen doesn’t cure poor writing. Practice is still required to abolish bad habits, but at least the tools don’t get in the way. I write more slowly with a fountain pen. I honestly don’t know how this comes about, but I have heard (or, rather, read) it a lot; people insist that the improvement in their handwriting (see previous) is brought about by speed limit enforced by the fountain pen. There’s several reasons why this is so much stuff, starting with the way ink comes out of the pen. It is possible for a human hand to cross a page faster than the combined effects of gravity and surface tension, which attaches the fluid to the page, can deposit ink, but at that speed all that’s being made is a singe slashing line. The smoothness of the tipping, the lubrication from the ink, and the general lack of pressure demands all add up to a writing instrument that allows for fast writing. As fast as I can move my arm. This was with an extra-fine point, too; a bigger point would keep up better. I speculate that people who make this declaration are subconsciously directing themselves to slow down; the fountain pen being so much less miserable to write with than a ball-point, there is no motivation to get the task of writing completed in the shortest possible time. A fountain pen won’t write on everything. Well… yes, that is true. Neither will most other sorts of pens. Markers are the most universal sort of pen, and this utility is paid for by the unpleasant sensations of moving their fibrous tip across fibrous paper, the way the tip goes dry if one is writing more than a sentence or two, and the habit of bleedthrough and feathering on any surface more porous than polished stone. This is a limitation I find I can live with. People make fun of “snobs” who use fountain pens. Those of us who are unhealthily obsessed with care a lot about pens are about the only people who will ever notice that someone else is using a fountain pen, and then it’s generally the sort of positive excitement of one Jack Russell terrier seeing another. On the rare occasion that I’ve had any comment whatever about using a fountain pen from someone not likewise fixated interested in the past ten years or so, it has been a variation on either, “Wow, that’s pretty!” or “Good heavens, do they still make those?” There is some chance that I avoid less positive comments through the luck of being a very large and menacing person, but in general I expect that anyone bullying a fountain pen user would find another “reason” to do so if the pen weren’t available. People who use fountain pens are snobs. Errr…. define “snob.” Using a very broad definition, this can be made a true statement. I admit to looking down upon most other sorts of writing implements (I could hardly have set up this site, never mind this slightly inflammatory page, if that were not the case), but I don’t make any value judgements upon the people who use them. Non-fountain pens are ubiquitous, after all, and it’s hardly sensible to despise swimmers for getting wet. There are indeed some people who are a little insufferable about their high-end, limited edition pens, but to tar all fountain pen users with that brush is like declaring all car-drivers to be the sort of gits who go on endlessly about how no one who doesn’t have a Bugatti Veyron can be be properly called a driver. Every hobby has its jerks.